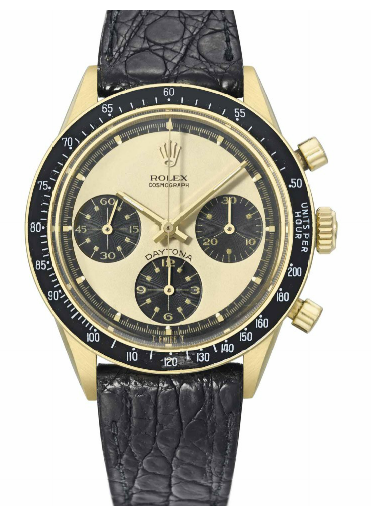 Rolex was well represented at the auction, offering many vintage and rare finds. One of the oldest and rarest examples featured was a 1949 18k gold automatic wristwatch with sweep centre seconds, star numerals, and Cloissone enamel dial. The most striking feature of this particular timepiece is certainly its enamel dial, created by famous Geneva artist Marguerite Koch. 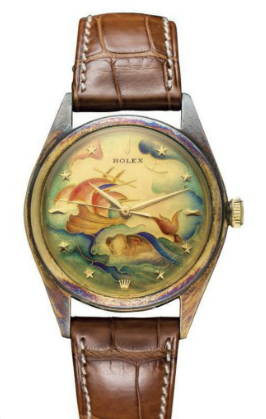 It displays a colorful seaside theme, complete with ship, whale, and waves. Considered one of the most important pieces ever manufactured by Rolex, this watch was expected to go for $560,000-$1.1 million. Its final sale price was CHF 1,097,000. This vintage timepiece was the most expensive Rolex sold at this auction, but also achieved a new world record for selling price of any Rolex sold at auction. The sophisticated and unique piece was certainly one of the rarest and most beautiful items offered. Another rare and beautiful find was the 18k gold chronograph, reference 6241. This particular watch is commonly known as the “Paul Newman” watch, as the famous actor was often pictured wearing a similar Rolex. This particular model is a fine example, having been well cared for and kept in the family of the original owner. The timepiece features a stunning champagne dial as well as three engine-turned black subsidiary dials for measuring speed. 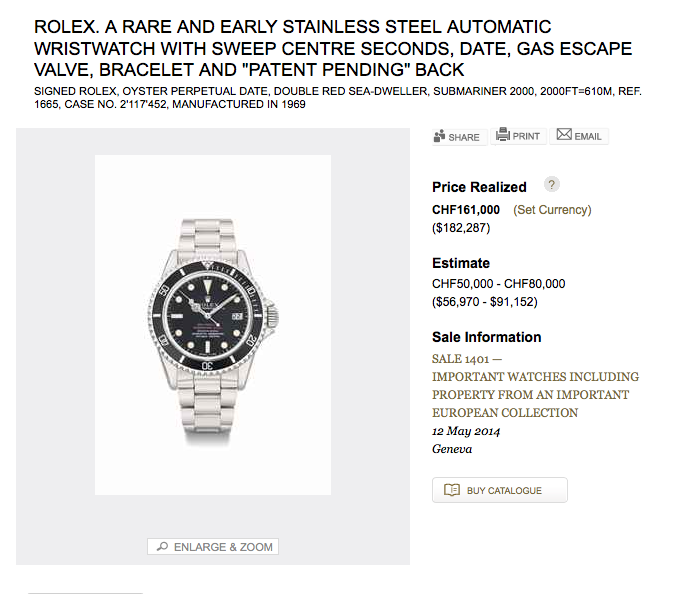 This watch was expected to go for $89,000-$130,0000, but resulted in a sale of CHF 221,000, a bit over the highest expected price. Several of the timepieces sold at the Christie’s auction are made even more valuable by additions made to them. For example, one Rolex Oyster Perpetual Sea Dweller model was originally made for the Sultanate of Oman. His signature is seen in red the middle of the dial, right under the Rolex signature. The combination of the prestigious Rolex design and craftsmanship coupled with the exclusive and much sought after Qaboos signature makes this particular watch extremely rare and valuable. It was expected to go for $273,455-$455,758, resulting in a sale of CHF 485,000, setting it above the estimated price range. 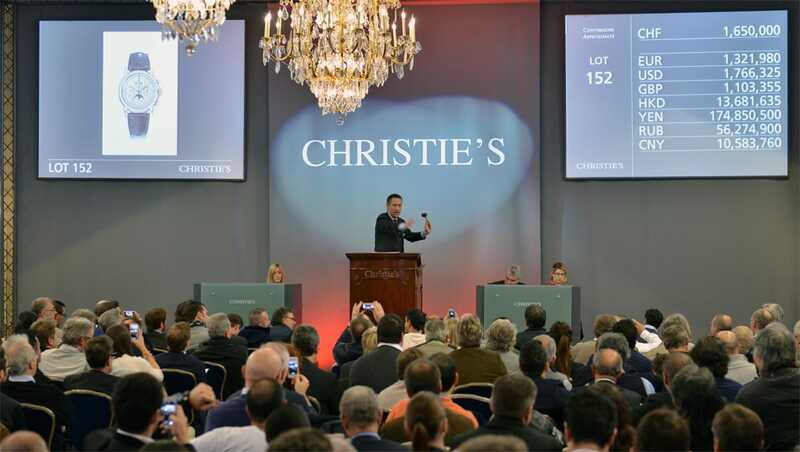 The wide variety of timepieces offered at the May 12th Christie’s auction resulted in record prices for many timepieces, including quite a few Rolex watches. Many of the items featured had never before been seen at auction, having been lovingly cared for by their original owners and their families. With record sales and exquisite items, this was certainly an event a Rolex collector wouldn’t want to miss.